IN STOCK: Jake's Texas Style Medium Hot Barbecue Sauce Special for chicken, ribs, pork, fish, steaks and Tri-Tip. Jake's Famous Texas Style Medium Hot Barbecue Sauce for sale delivers a bold rich hickory flavor and has the richness and flavor of all natural ingredients made with hand selected habanero, jalapeno and fresh ginger. This is the best barbecue sauce for ribs, shredded chicken, baby back ribs, turkey, sandwiches, grilled fish and more. Wonderful levels of flavor combined with the perfect balance of heat. This Sauce produces a wonderfully warm heat and an old school taste with flavors reminiscent of Georgia, Mississippi, Florida and with a slight cross of Texas barbecues. The sauce is perfect for basting and marinates deeply within 45 minutes to an hour. The sauce is made from natural, gluten free ingredients and is considered healthier. The sauce has just a slight sweetness to raise the taste buds. And the sauce can be used overnight in the marinating process along with delivering smokiness for those who do not have wood smokers readily available. Finally the sauce reduces the amount of time you spend on the grill. It does not require hours of blending as some do once they buy a sauce. With that additional time saving besides being one less thing to worry about it means you can spend more time enjoying the barbecue and less time preparing it. To Get the Sauce Click on the Add To Cart button and follow to Checkout. M. Knight wrote: "Jake's sauce distinguishes itself with a flavor that is unlike any other BBQ sauce I typically use. Nice use of the ginger, habanero, and jalapeno in your hot sauces." Scott Roberts"Overall: Buy this stuff. It's the real deal, and it may become one of the 2 or 3 best barbecue sauces you've ever eaten (as it has with me. Yet another spicy food product that gets the "Scotty Highest Recommendation". Recommended Uses: BBQ Hot Wings, homemade barbecue bbq rib recipes, bbq chicken recipes, bbq beef recipes, wings recipes, BBQ Sauce and glaze for fish and more. Details: Convenient, easy to use 12 Oz recyclable glass containers, stores easily with a shelf life of 18 Months. 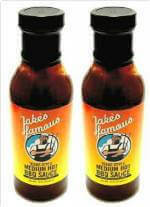 Need great gifts Buy Jake’s Famous Texas Style Medium Hot BBQ Sauce for sale.